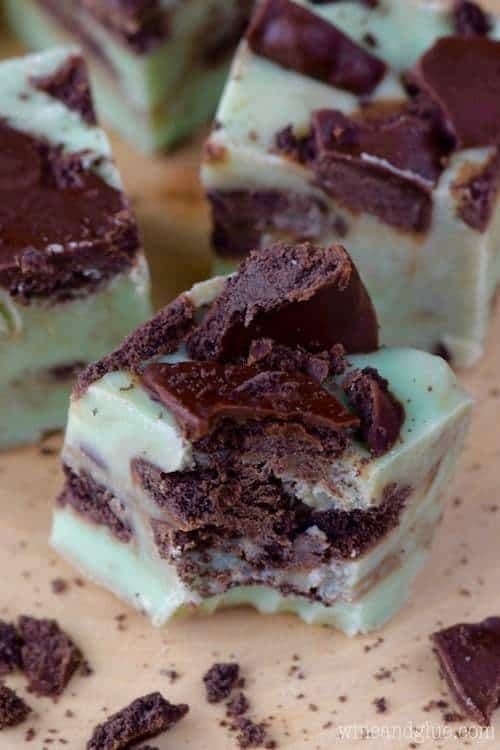 This Grasshopper Fudge is crazy easy to throw together, but so good! 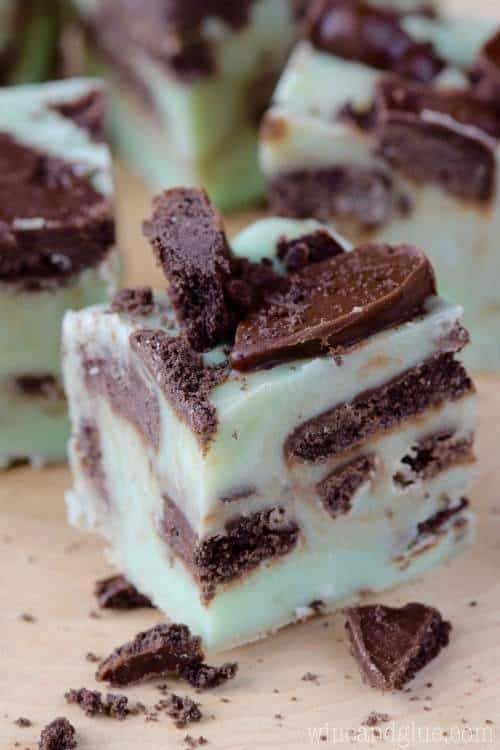 The perfect combo of mint, crunch, and smooth fudge! Hi Java Cupcake fans! My name is Lisa and I’m so happy to be here today for a guest post! 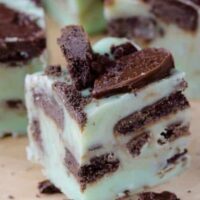 I blog over at Wine & Glue all about easy dinners, fun crafts, my crazy kids, and delicious fast deserts like this Grasshopper Fudge! I love easy fudge recipes so much! They are a pretty standard formula: 3 cups chocolate chips + 1 14 ounce can of sweetened condensed milk (make sure you get SCM and not evaporated milk . . . that will never work and leave you really irritated with me). 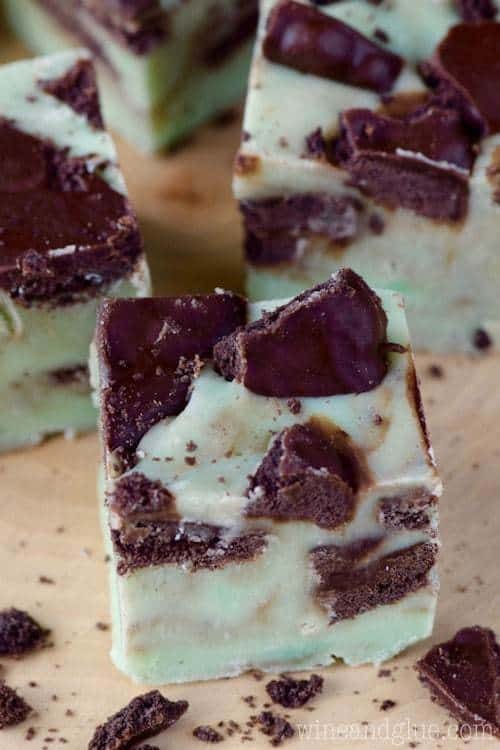 If you like this recipe, you can find 25 MORE crazy easy fudge recipes here! You can find more easy recipes like this one by following me on Pinterest, Twitter, Instagram, and Facebook! 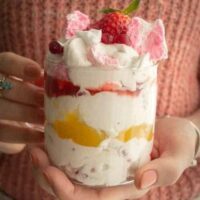 When you saw the title of this recipe did you ask yourself what the heck is Eton Mess? Did you Google it? It’s ok, I had to, too. Go ahead, I’ll wait right here if you want to look into it real quick…. 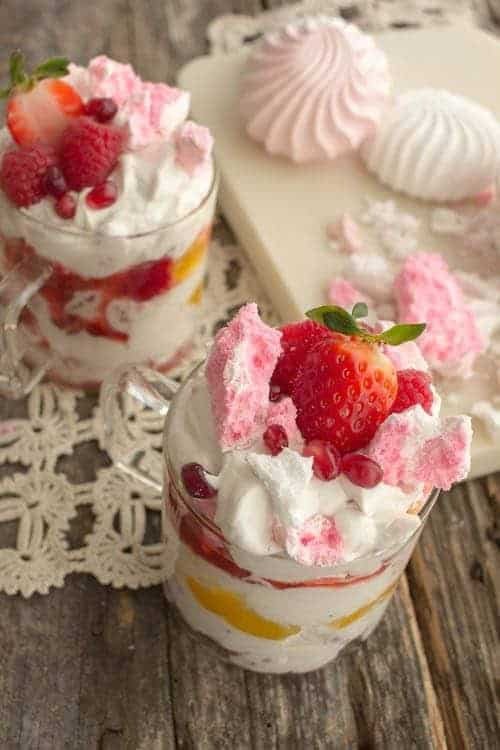 According to Wikipedia, Eton Mess is an old school, 19th-century English dessert that combines whipped cream with luscious berries and meringue cookie crumbles! Drooling yet? 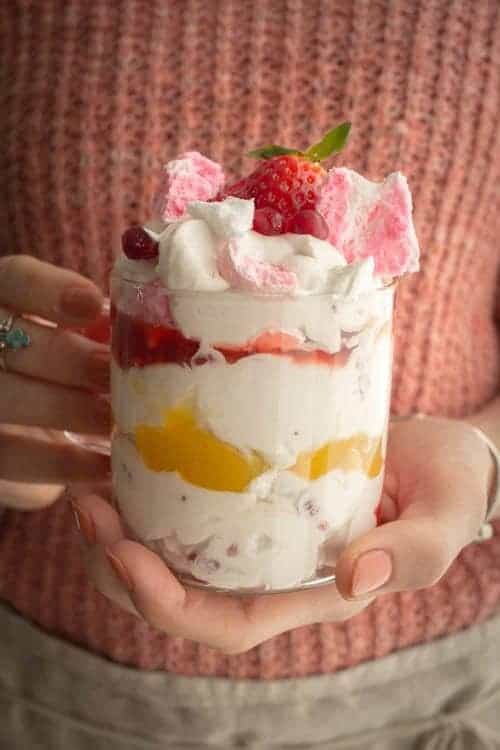 I have been whipping up versions of Eton Mess since I was a little girl, although back then I didn’t know it was an actual dish that other people ate and I had no idea what a meringue was. I just crumbled chocolate chip cookies on top of whipped cream and crushed berries because it’s a delicious combo! Like many of you, I am one busy mama that is always looking for fast and easy treats for my family that don’t require a huge time commitment and Eton Mess fits the bill every single time. In honor of Valentine’s Day and my hubby’s love for coconut, I whipped up this Coconut Cream Eton Mess with Mixed Berries to share here today. It’s the perfect representation of who we are as a family – definitely a little messy, just the right amount of sweet and a zest for life that can’t be stopped! This decadent treat comes together in less than 15 minutes and is sure to blow your Valentine’s mind! Don’t worry though if you aren’t a coconut fan, simply substitute with regular whipped cream. I promise you are going to love this sweet treat either way! 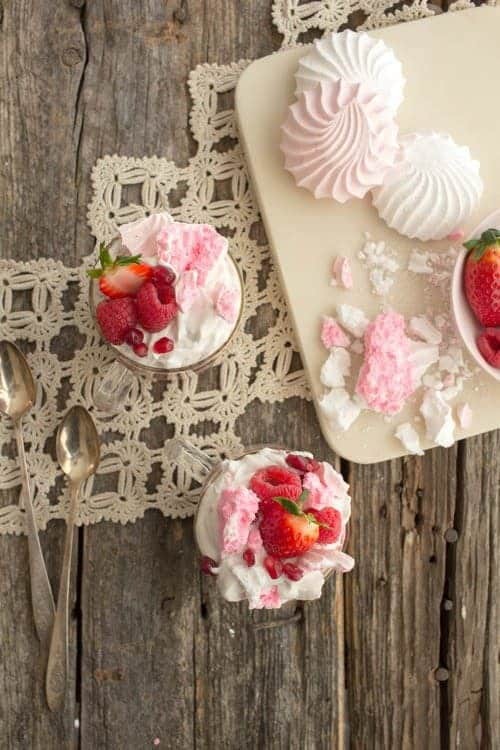 Use this recipe as a template for an infinite amount of Eton Mess possibilities! Swap up the whipped coconut cream for yogurt or whipped cream, use a different type of fruit or even swap out the cookies you crumble on top. The sky is the limit! In a mixing bowl combine the chopped strawberries, raspberries, and pomegranate juice. Mash the berries with a potato masher until they are broken down and everything is combined. Set aside to marinate. Scoop the chilled coconut cream into the bowl of a stand mixer with the whisk attachment. Whip at medium-high speed for 1-2 minutes until stiff peaks have formed. Add the maple syrup and vanilla and whip at high speed until completely combined. Gently fold 3/4 of the berry mixture into the whipped coconut cream. In 4 glasses or bowls spoon even layers of the whipped coconut cream only-del replaceWithoutSep" id="96" data-gr-id="96">mixture, then macerated berries and a drizzle of lemon curd. Crush meringue cookies and sprinkle the cookies on top of the layers then repeat the process of layering and sprinkling until the glasses are filled. Top with fresh berries and more meringue cookie crumbles. Serve immediately. If you can't find cans of coconut cream at your grocery you can use full fat coconut milk instead. Just follow the instructions in this tutorial. It’s been amazing to share a little bit of our life here with you today! I hope we can keep in touch and that I hear from you soon!! Greetings from Lisa Keys from Good Grief Cook. 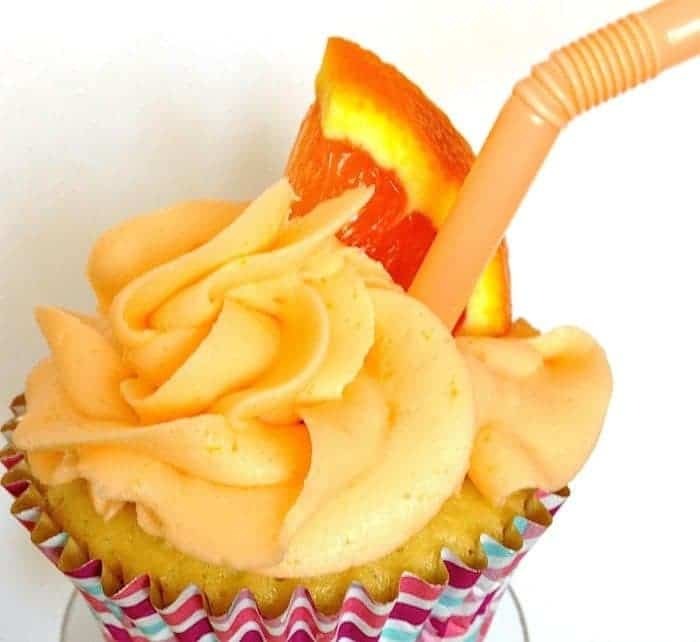 I’m here today as a guest blogger, but before I share my recipe, for Orange Crush Soda Cupcakes, I thought I would tell you a little bit about myself. I have been an award-winning self-taught home cook since 1990, when I began entering recipe contests. Recently, I became a Food Network CHOPPED Champion, here today as a guest blogger. I started my blog, Good Grief Cook after losing my son William in an accident in 2011, to follow in his light and share my thoughts about life, love and the healing power of food. Cooking and baking are very therapeutic for me. Since I started Good Grief Cook, I’ve been able to celebrate my son in a most unique way, with recipes inspired by the places I’ve been and the people I love. Speaking of love, here comes Valentine’s Day. It is one of those love-hate holidays for most. Hopefully, you have a “crush” on someone and here is a simple way to show it. Buy a can of Orange Crush soda and with a Sharpie, pen a sweet message on the can. 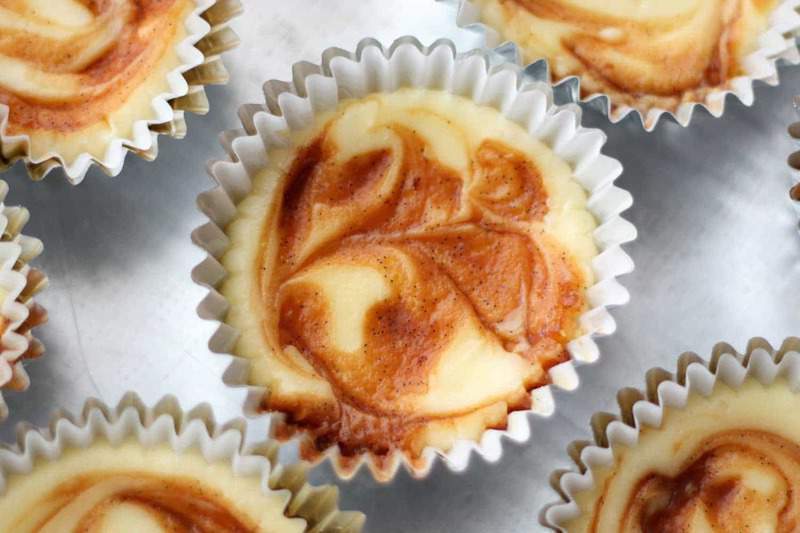 Then…..print out this recipe and give it to them so they can bake you these cupcakes. I prefer baking from scratch and cooking with seasonal ingredients. 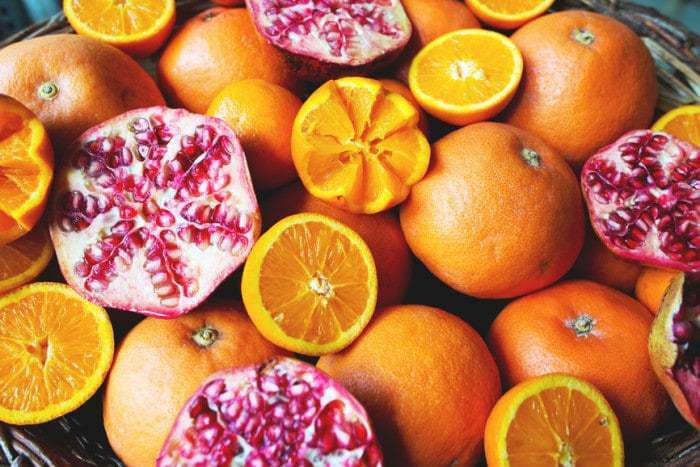 During the winter months citrus is at its peak. Oranges are hands down one of the best ways to add a fresh and zesty spin to cupcakes. Using all parts of the orange (zest, juice and fresh slices) add up to one fun and refreshing treat. To make the cupcakes: Heat oven 350F. Line cupcake tin with paper liners. Cream butter, sugar, zest and orange oil with electric mixer until light and fluffy. Add eggs, one at a time beating until well incorporated. Mix flour, baking soda and salt. Gradually add in dry ingredients alternating with orange soda, scraping down sides of bowl as needed. Beat one minute until all is thoroughly mixed. Scoop batter into prepared liners filling ¾ full. Bake 20 to 22 minutes or until wooden pick inserted in center comes out clean. Cool and frost. To make the frosting: Beat all ingredients together adding just enough orange juice to make a fluffy frosting. 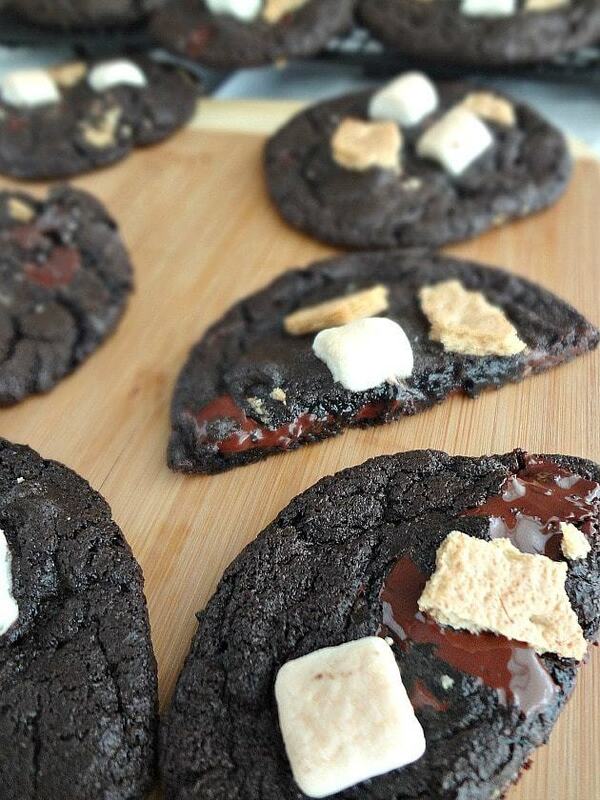 A sweet guest recipe for you today that transforms your favorite summertime dessert into decadent, delicious Chocolate S’mores Cookies! Hello there JavaCupcake readers!! My name is Kayle and I’m the gal behind the food blog, The Cooking Actress. In case you didn’t get it…I’m an actress…and I cook. I also live in Ohio (my home state, but I moved here a couple years ago from NYC) with my husband and I love to make homemade crave-worthy foods! There, now we’re introduced. Nice to meet ya 🙂 I’m so excited to be here and help Betsy out while she takes care of her family and prepares for their move and such. She’s seriously one of the sweetest, strongest women I know-I’m sure you all agree. PLUS-she makes some of the most gorgeous and delectable looking sweets, that is just a fact! Alright now…let’s talk cookies. They’re kinda my thang. I’ve been referred to as the cookie queen on more than one occasion…just sayin’. Ha, but seriously they’re my favorite and I do sort of think of them as my specialty. Which is why I’m always wary of buying cookies because they so rarely live up to my expectations, especially now that I live in OH-which has admittedly fewer quality bakery options than NY did. 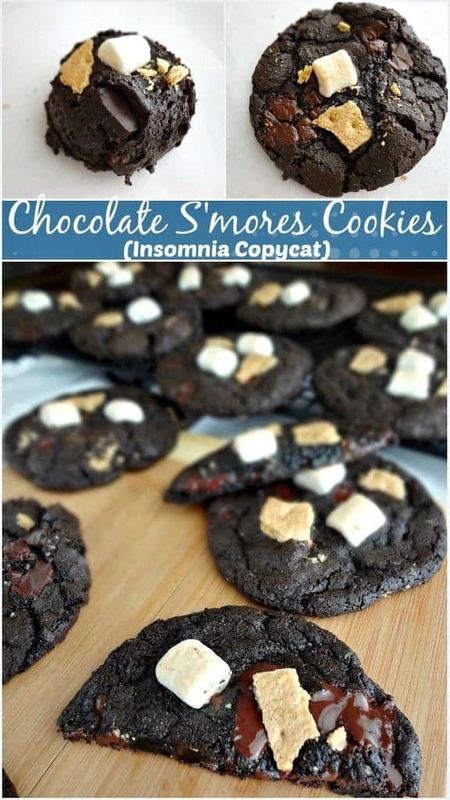 BUT there is one place I’ve found that has solid cookies…Insomnia. They’re a national cookie chain that has shops located on/near college campuses and they deliver until all hours of the morning. I do not live on a college campus BUT I do live 15 minutes away from Kent, a college town (Kent State University…where my husband is getting his master’s and almost everyone I know went for undergrad)-and they have an Insomnia Cookies, and I have had the pleasure of stopping in and enjoying said cookies on more than one occasion. Although Insomnia has a few different kinds of tasty looking cookies, I am always drawn to their Deluxe S’mores Cookie—it’s just something I can’t get anywhere else. And I LOVE IT! They’re the kind of smart bakery that serves your cookies warm, as they should be. 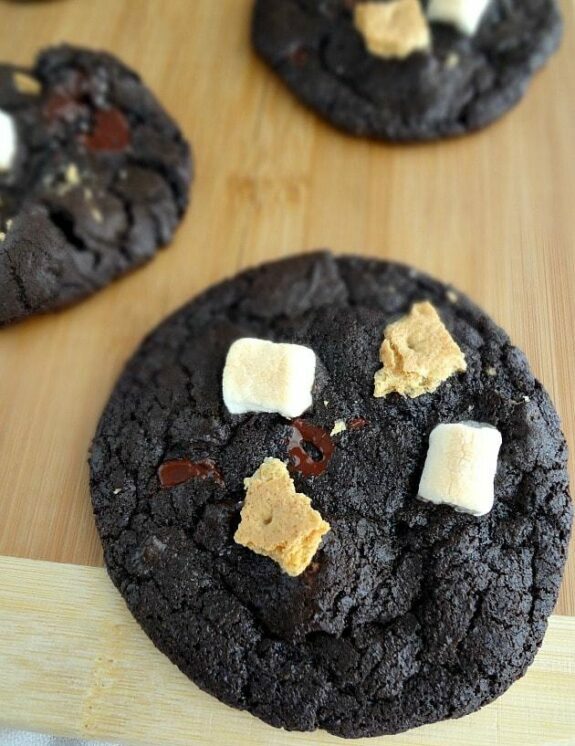 And the cookie is chocolatey and chewy and has gooey mini marshmallows and little bites of crunchy graham crackers…and I live too far away to have them on the regular. So-I decided to make my own! Ahhh I was nervous! I tried scouring the internet for their recipe or copycat recipes and nothing was right! I needed a fairly flat, definitely large, yet chewy and gooey and very chocolatey cookie base-I knew as long as I had that I could just add mini marshmallows and graham crackers and that would be simple enough to figure out. So I searched. And I found something I thought might work. And then I adapted it slightly (baking it for less time so they’re softer and chewier, in addition to adding the ‘mallows and grahams). And I reveled in my success….I HAVE DONE IT! I recreated the cookies (…pretty close anyway. As close as I think is possible without the actual recipe) and they are delicious. I’m so excited. And I’m so excited to share them with YOU GUYS! 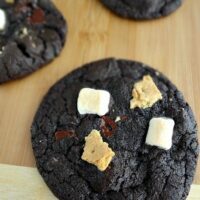 My brother (who is currently in basic training for the Air Force) shares my love of the s’mores cookies and I know he’d love these. Which is why I’m freezing some to bring to him when I go to his graduation, and why I plan on making and shipping him a batch once he’s out of basic. Because I’m a good sister 🙂 But for reals…these cookies are so decadent and rich and perfectly chewy and they have gorgeously melted chunks of chocolate (I prefer dark but feel free to use milk!) and little bits of graham cracker and then-GUYS-some of the mini marshmallows toast while they bake. 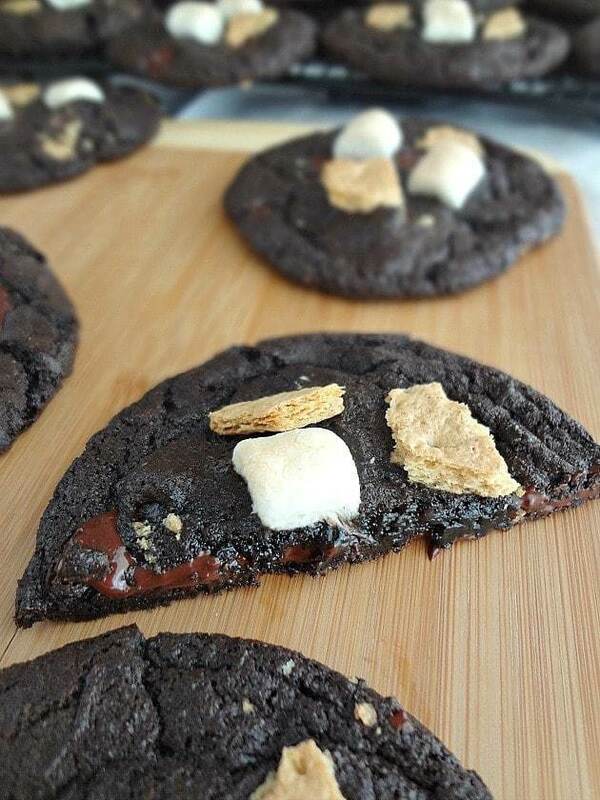 So the s’mores-ness is on the next level. They’re everything I wanted them to be and more and I know you’ll all love them as much as I do! Find more about Kayle here! Preheat oven to 325F degrees. Line a large baking sheet with parchment paper. Melt chopped chocolate with the butter in a small heatproof bowl set over a pan of simmering water. Remove the bowl from heat and let cool a few minutes. Add sugar, eggs, and vanilla to the chocolate mixture and, using an electric mixer, beat on medium speed until combined. Slowly mix in the dry ingredients on low speed. Fold in chocolate chunks, 1/2 cup mini marshmallows, and 2 squares of broken up graham crackers. Scoop batter using a large cookie scoop (about 1/4 cup of dough) and place at least 2 inches apart on the prepared baking sheet. Press the remaining mini marshmallows and broken up graham cracker bits into the tops of each cookie dough ball (approx. 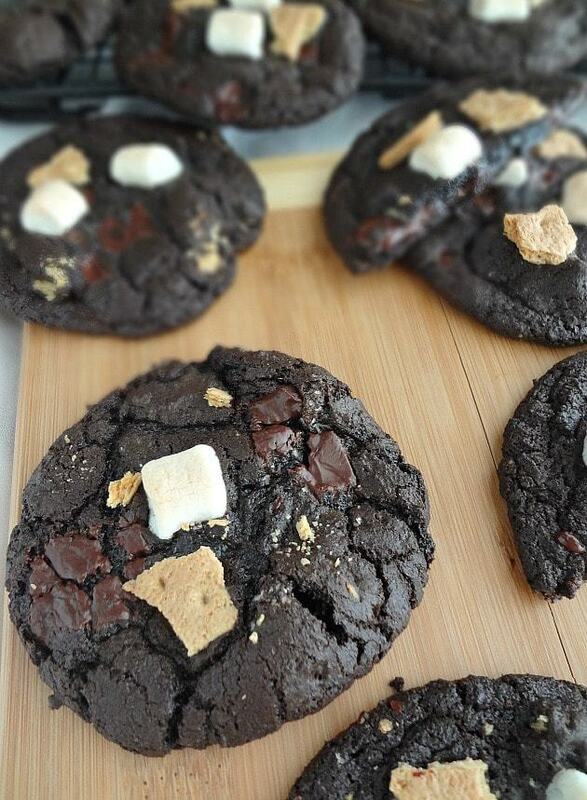 2 marshmallows and 2 graham cracker pieces per cookie). Bake until cookies are slightly only-del replaceWithoutSep" id="165" data-gr-id="165">flattened, about 12 minutes. Let cool on the sheet for at least 5 minutes before transferring to a wire rack to finish cooling. 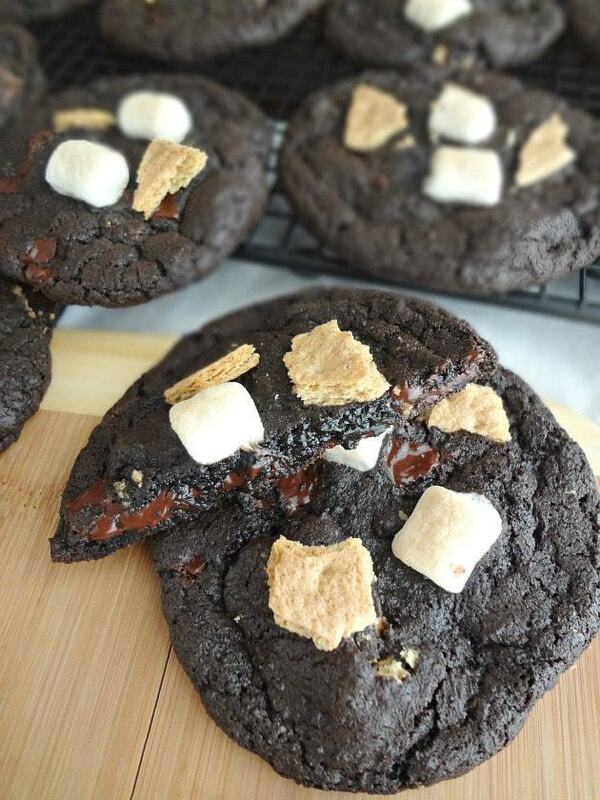 Adapted from Martha Stewart's Double Chocolate Chunk Cookies and inspired by Insomnia Cookies' Deluxe S'mores Cookie. Oh hiiiiii! I’m Heather – a friend of Betsey’s – and today I made you a pie! Other days you can find me over at Sugar Dish Me where I share lots of food and talk too much about dogs. Since Betsey and family are making the looooong trek back to the states with all their stuff in tow, it seemed like the perfect time to jump over here and talk to all of you so Miss Java Cupcake can relocate all her sprinkles and put away all her muffin tins. Everyone loves a no-bake pie recipe, right? This one is super easy – like you could probably make it even if you had to move back to the U.S. from Germany and your kitchen was full of boxes. 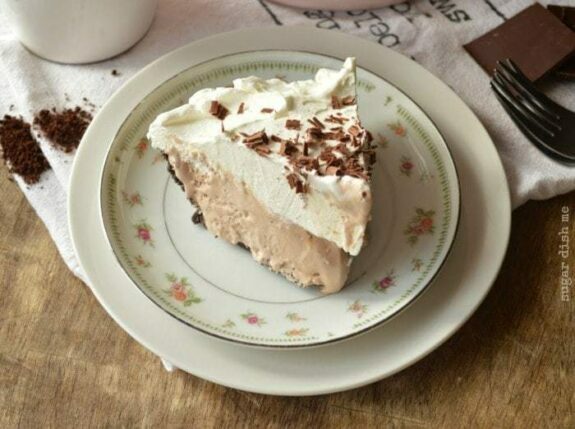 I based this recipe on everyone’s favorite no-bake peanut butter pie. You know the one made with cream cheese and cool whip? THAT. Plus I added instant espresso (not your grandma’s Sanka), and chocolate spread. Let’s discuss chocolate spread. I used Hershey’s because it was the only one I could find without anything added to it. There are lots of varieties made by lots of brands. Last year JIF had a mocha cappuccino spread that would have worked perfectly, but I couldn’t find it. The moral to this conversation is to use what you like/can find without going to a zillion stores. Next we are going to talk about Cool Whip. Please don’t send me (or Betsey) Cool Whip hate mail. 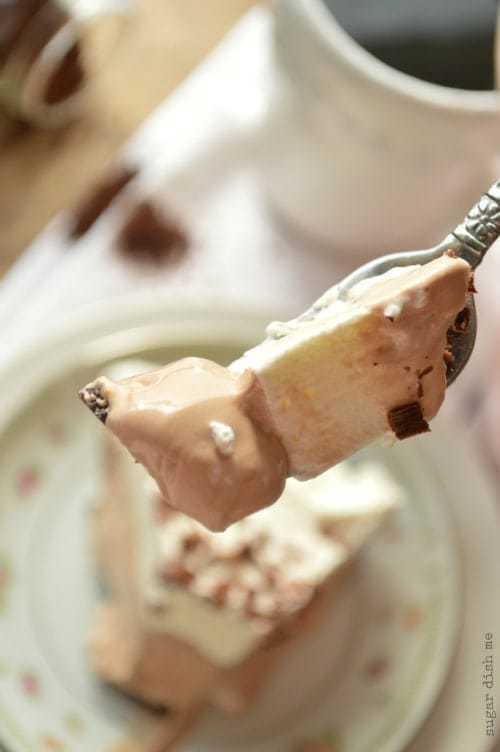 Cool Whip has it’s place in the no-bake dessert world and I’ll tell you why: TEXTURE. So. All that pretty whipped fluffiness on this pie? It’s fresh, delicious, I-made-it-myself whipped cream. I adore it. I can (and do) eat it straight from the mixing bowl with a spoon. IN the pie though, I use Cool Whip. Because it keeps the filling soooooooper creamy. It folds in without falling. It thaws faster when you are ready to serve. 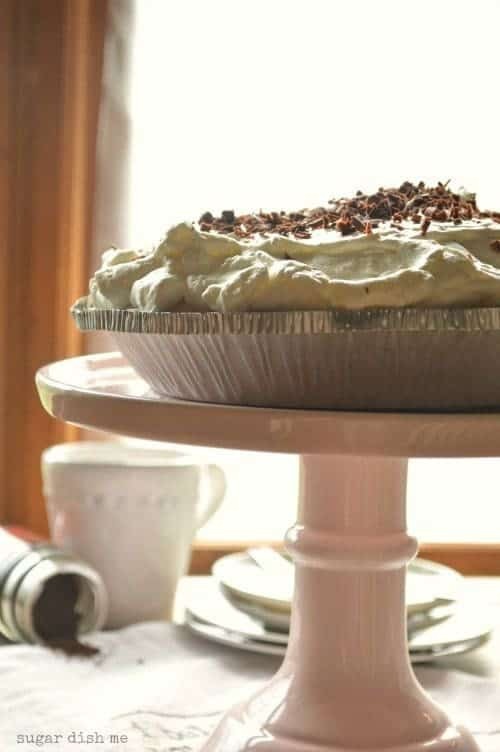 (you can even buy 1/3 fat versions if you wanna cut some calories etc) All of that said, if you are a stickler, you can make this pie with natural homemade sweetened whipped cream. I’ll leave that up to you. 10 minutes of prep, pop it in the freezer, and 2 hours later you have the prettiest pie loaded with chocolate coffee flavor. 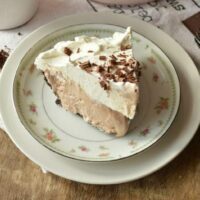 Mocha Latte Pie! Perfect for a blog called Java Cupcake I think. Cheesecake is my favorite. 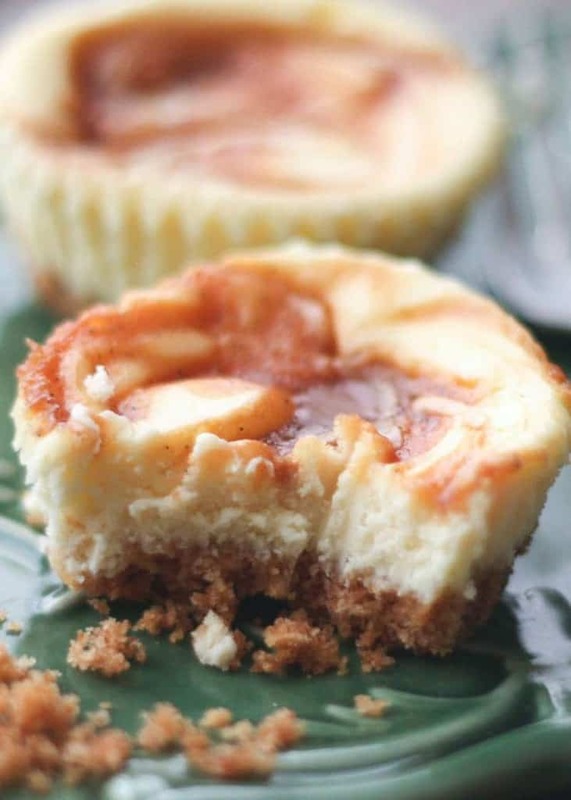 If it is also your favorite you should try this Bourbon Cheesecake with Boozy Chocolate. I really like cooking and baking with booze. If you love dogs I will be your best friend. I volunteer with a rescue group and we have 5 dogs plus two foster dogs right now. Yes that is 7 dogs. 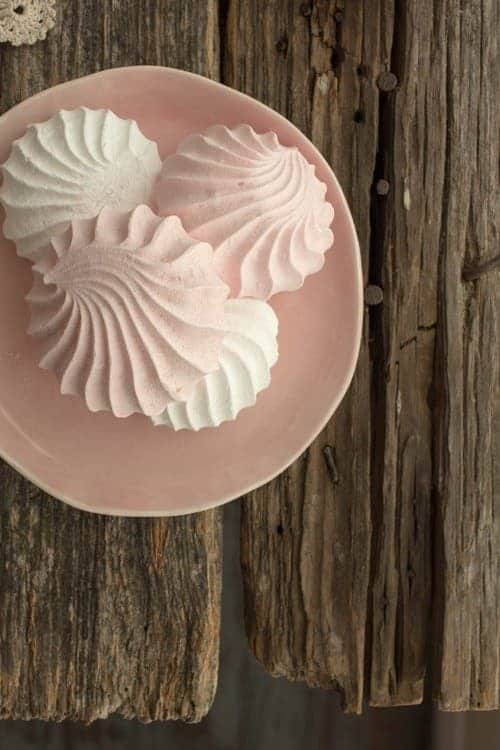 I’d love it if you joined me on Instagram, Facebook, Pinterest, and Twitter! Beat the cream cheese and powdered sugar together until fluffy. Add the chocolate spread and espresso powder. Beat until combined. Then mix in the vanilla and milk until smooth. Using a rubber spatula fold in the Cool Whip until it is evenly incorporated. Divide the pie filling between the two crusts. To make the topping add the heavy cream to the bowl of a stand mixer and beat on med high until stiff peaks form, adding the powdered sugar a tablespoon at a time while it mixes. 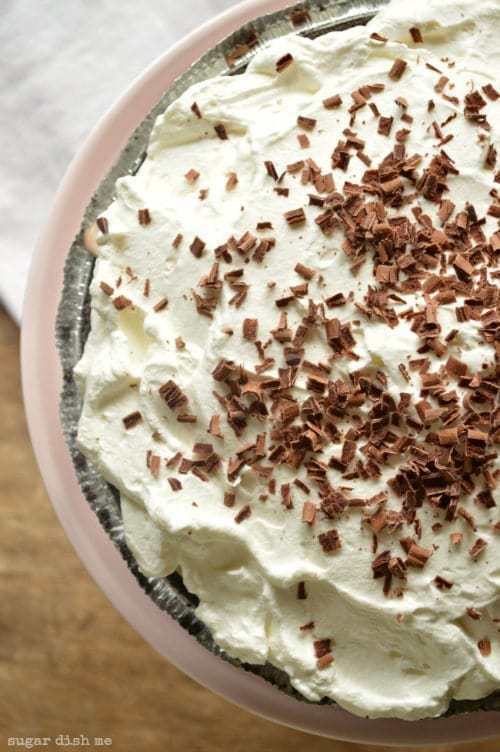 Spread over both pies and cover with the shaved chocolate. 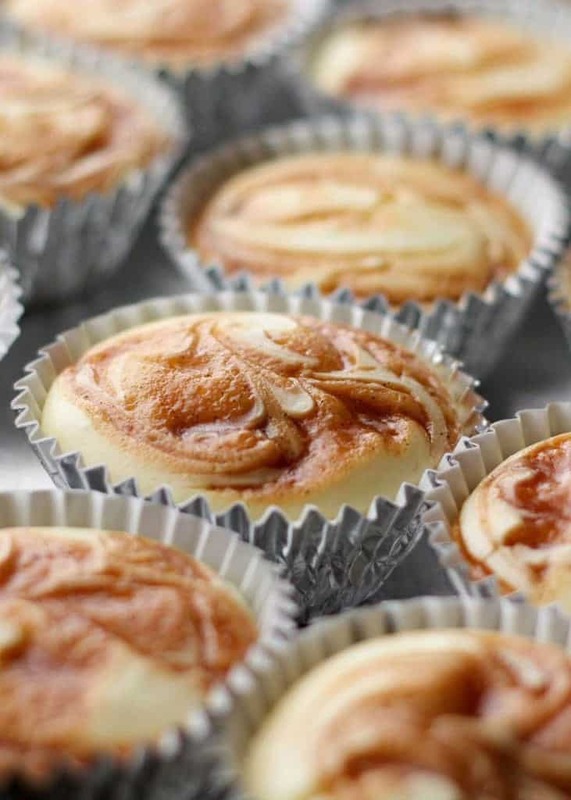 These caramel swirl cheesecake cupcakes are mini bites of cheesecake heaven and I can’t wait for you to try them! Hi! My name is Mary and I blog over at Barefeet In The Kitchen. I’m excited to be sharing one of our favorite sweets with you today. Thanks to Betsy for being gracious enough to share her space with me! 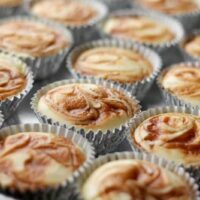 These Caramel Swirl Cheesecake Cupcakes start with smooth and creamy cheesecake over a simple graham cracker crust, then they are topped with a swirl of caramel sauce just before baking. Homemade caramel sauce is a breeze to make and if you don’t already have a favorite recipe, I highly recommend Vanilla Bean Salted Caramel Sauce. If you’re in a hurry though, a store-bought caramel will work beautifully as well. While the cupcakes are pretty spectacular on their own, for an extra special dessert, I like to top them with a generous drizzle of warm caramel just before serving. Preheat oven to 325 degrees. Mix together the graham cracker crumbs, brown sugar and butter. Scoop 1 tablespoon of the crust mixture into the bottom of each cupcake liner. Press down the mixture with a small measuring cup or the bottom of a drinking glass. Bake for 5 minutes and then remove from the oven. Beat the cream cheese until it is smooth. Add the sugar and beat for about a minute to combine. Add the vanilla and then the eggs, one a time. Beating until the mixture is smooth again between each egg. Scoop 3-4 tablespoons of the filling over the slightly cooled crusts. Smooth slightly or tap the tray to spread across the crusts. 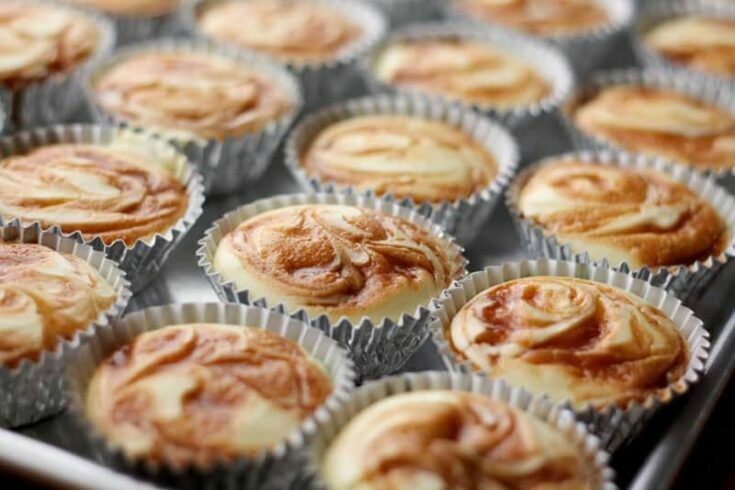 Drizzle 1 teaspoon of caramel over the top of each cupcake and then swirl lightly with a toothpick. Bake for 22 minutes and then remove from the oven. The cupcakes will be puffy and rounded when you remove them from the oven, they will sink as they cool. Let cool at room temperature for about an hour. Then transfer to the refrigerator and chill for at least 4 hours. Drizzle with additional warm caramel sauce just before serving, if desired. Enjoy!